Overnight breakfast casserole with bacon and sweet potato is a healthy, hearty breakfast for a crowd! Assemble it the night before, refrigerate, then bake it up in the morning. Gluten-free and lower in carbs. Looking for a crowd-pleasing breakfast recipe that doesn’t require you to get up at the crack of dawn? 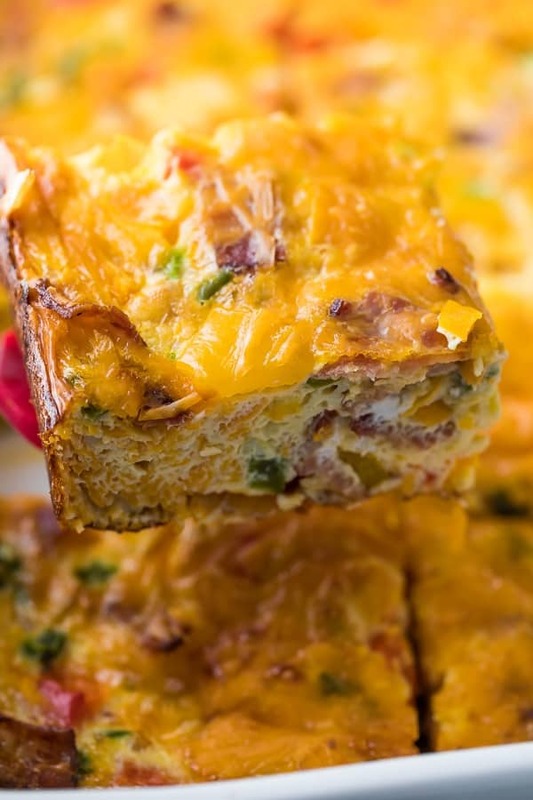 Then look no further, this overnight breakfast casserole is perfect for you! Psst! 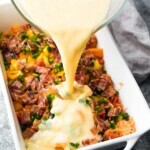 You might also be interested in this Crockpot Breakfast Casserole! Not only is it packed full of veggies and eggs, but it has a delicious sweet/savory and slightly spicy thing going thanks to the sweet potato, bacon and jalapenos. 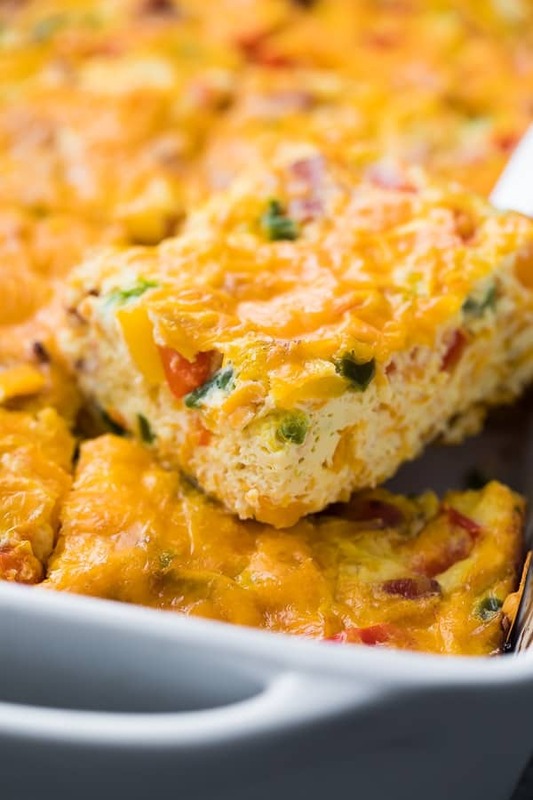 This overnight breakfast casserole is perfect for an Easter brunch, or for when you have family in town, because after you’ve chopped all your veggies, its super hands-off. Aaaand it re-heats like a dream. Leftovers make for a great lunch, and they actually keep you full, thanks to all the protein from the bacon and eggs. It’s about time I share an overnight breakfast casserole around here! With two little kids, I find myself at a bit of a loss for what to serve for brunch; waffles and pancakes are popular but require so much effort in the morning. 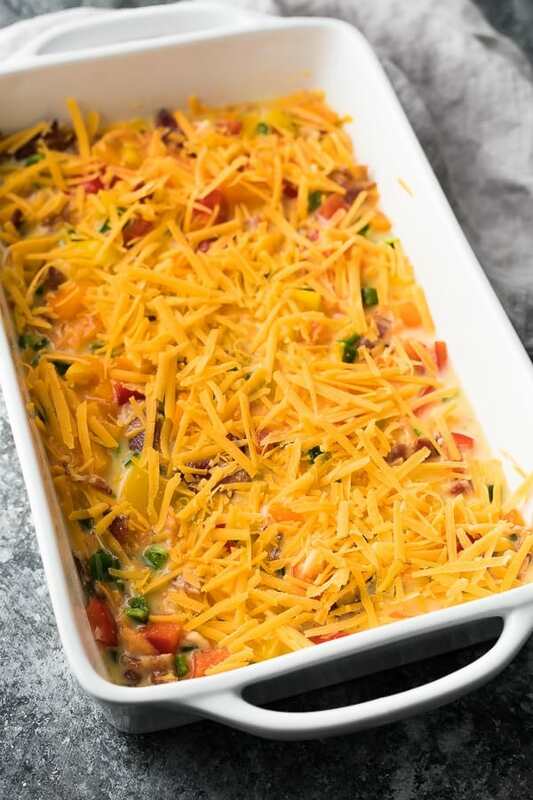 Prepping this breakfast casserole the night before makes it so hands off the next morning, which leaves you free to hang out with your guests rather than being stuck in the kitchen! 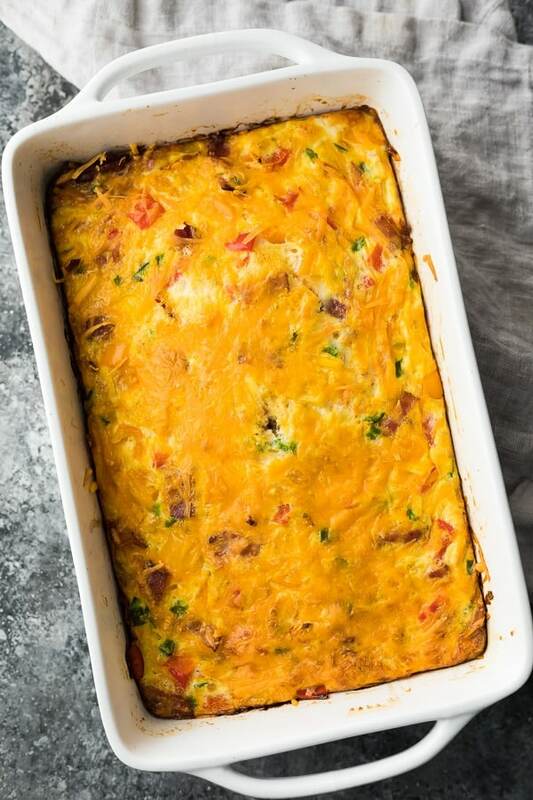 You could make this breakfast casserole as a meal prep breakfast as well; the leftovers are great for a breakfast or lunch, and they even freeze well! in individual portions: After baking, cool and portion out the breakfast casserole. Wrap with plastic wrap and store in a large freezer bag or individual container. Thaw completely, then heat in the microwave. You may wish to heat on a paper towel to absorb any extra moisture that can leak out during the freeze/thaw process. whole casserole: Cool completely, then cover with plastic wrap and foil. Freeze up to 3 months. Thaw completely and re-heat (covered with foil but not plastic wrap) at 350°F for 30-40 minutes or until warmed through in the center. Depending on the dish you use to bake this overnight breakfast casserole, you may need to alter the bake time slightly. You will know it’s baked through when the center rises slightly and no longer jiggles. I also double checked by inserting a knife in the middle and making sure there wasn’t any liquid oozing around. mushrooms, asparagus, spinach, even broccoli (chopped very small) would be great in this casserole! Watch the video below to see exactly how I prepped my Firecracker Chicken Meal Prep Bowls. It’s so easy! You can find more of my recipe videos on my YouTube channel, or on Facebook. Heat oven to 375°F. Spray a large casserole dish (9 x 13 or 8 x 13) with oil and set aside. Cook bacon and allow to cool slightly. Chop into pieces. Beat the eggs, then stir in the milk, salt and spices. 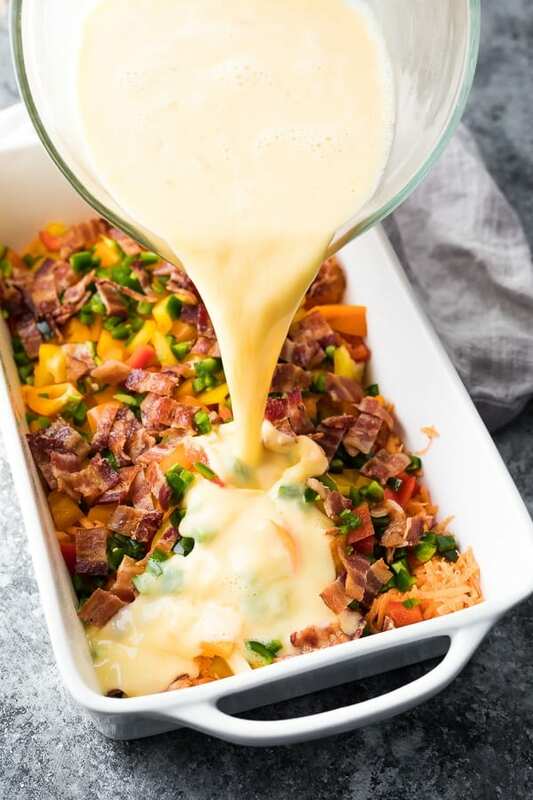 Add the bacon, vegetables, and one cup of cheese to the casserole dish, then pour the egg mixture over top. Stir everything up and sprinkle the remaining cheese over top. At this point, you may cover and refrigerate overnight, or bake immediately. Bake for 45 minutes to 1 hour (mine was ready in 55 minutes). The center will no longer jiggle and will rise slightly when the casserole is finished. Double check that it is cooked in the center by inserting a knife. Allow casserole to sit for 10 minutes before serving. This sounds amazing! Do you think you could use frozen shredded potatoes instead of sweet potato? Hi Amanda! I haven’t tried, but I bet you could. I’ve seen breakfast casserole recipes that don’t even thaw the potatoes. Hope you enjoy! 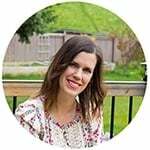 Can you provide instructions for freezing and reheating? Oops! Never mind! Just saw the instructions.